Does your classroom mirror the rectilinear seating arrangement popular in Sumerian classrooms, circa 2000 BCE? Or is your classroom seating flexible and tricked out with the IDEO designed Node Chair by Steelcase? What classroom design changes can you do on a budget that supports learning? Those questions and more are answered below. Flexibility: Students should be able to easily transition to functional spaces, such as a class library, literacy center, computer area, stage, reading nook, etc. Belonging: Learners should feel like the space is theirs. Put up pictures of kids and exemplary work. Put up posters that feature diverse faces. Interaction: By turning their seats, students should be able to quickly work with a small group. Neat: Supplies, tools, furniture, and books should be stored instead of left out (see Scholastic's Survival Guide and list of clutter busters, and Pinterest's DIY Classroom). In 2011, Kenn Fisher, head of the OECD Programme on Educational Building, stated that air quality, temperature, and lighting are linked to student behaviors and academic performance. A number of studies on temperature with office workers (not students) demonstrate that excessive humidity and class temperatures above 77 and below 72 degrees Fahrenheit degrade mental output and attention span. As the instructor, you might be hot from continuously moving all day. So set the temperature for your students. Do fluorescent lights negatively impact cognition? Dozens of studies on the subject since the 1940s offer contradictory conclusions. Also, your classroom walls are important learning real estate -- spaces to fill with content-related murals, posters, banners, whiteboards, and bulletin boards. My first classroom bulletin board featured a hundred hand-colored carp. Sadly, my tribute to oily freshwater fish had nothing to do with second grade curriculum. This would have displeased a high-strung principal that I talked to a while back -- he bragged about making an instructor tear down a bulletin board that didn't display standards-based content with clear visual communication. Bulletin boards today are expected to reinforce concepts, skills, rules, and routines; to present exemplary work; and to showcase students' photos and awards. The best of them are also decorative, alliterative, and playful. Consider creating a graphic organizer on a bulletin board in front of students while introducing a new concept. As the display grows more elaborate, students' conceptual knowledge will deepen. Later, you can refer students back to the display. Conversely, challenge them to collaboratively design a display that visually organizes their content understanding, using something like Heidi McDonald’s book report templates. But check to ensure that no misconceptions or misspellings have been posted. To enhance eyeball appeal, Kim's Korner suggests making bulletin board borders with wide ribbons, hot-glued crayons, or laminated wrapping paper cut into strips. Classroom Environments: What Does Research Say? 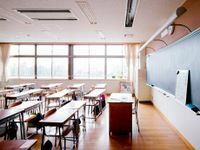 While their conclusions are not irrefutable, recent studies point to the classroom environment features that benefit students. Do students in classrooms learn better than students in portables? Perhaps not. No statistical difference in test scores was evident when those two groups were compared, according to Robin Stubbs Collins' dissertation. 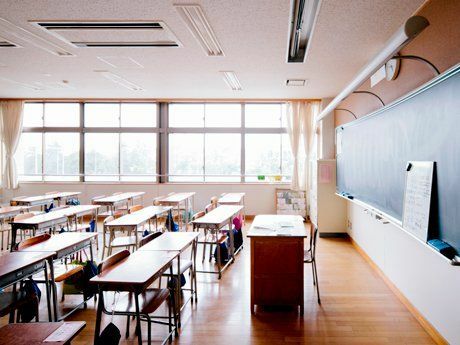 Are heavily-decorated classrooms too distracting? Off-task behavior lasts ten percent longer in heavily-decorated classes, reports Carnegie Mellon's Anna Fisher, Karrie Godwin, and Howard Seltman. Betsy Weigle shows how to reduce classroom clutter. Shelly Gray demonstrates several creative uses for Ziploc bags and cereal box cardboard. Ms. Hepburn shows how to prevent pushing and shoving near her first grade students' cubbies. Her other video explains how to organize student work in folders. Chelsea Lynn talks about how she readies a classroom for differentiated learning. Check out Jo L's swag wall. Don’t miss Ms. Navarro's purposeful bulletin boards, whiteboard organization, bins with self-trackers, and other classroom design innovations. Alejandra Costello helps a high school math teacher organize her class. Classroom Caboodle shows teacher supplies that you can buy at a Dollar Store. Here's one last tip. During the opening minutes of my first class, I almost always project a spectacular video of Ocean Beach. As they arrive, students sit spellbound as white water greets the earth and is reclaimed by the sea. Faces relax, a sure sign that kids are ready to learn. What classroom designs or organizational tips do you use in your classroom?